A recent call to our incident hotline alerted us to large numbers of dead and distressed fish at Ladygrove Lakes, Didcot. Given the reported scale of the incident, we immediately despatched a fisheries officer to investigate. As the lakes are in my ‘patch’, that job fell to me. I grabbed a dissolved oxygen meter and headed out. I found around 150 dead coarse fish, mostly adults, including common bream, silver bream, roach and perch. I checked the oxygen levels in the lakes and found them to be very low, at around 12-15%. Broadly speaking, healthy levels should be at least 50%. Subsequent checks showed levels to be increasing though and it was clear that the worst had passed. As there was no evidence of any pollutants in the water, the likelihood is that an algal bloom caused the crash in oxygen levels. What the cause of the bloom was is harder to ascertain, as there are many different possible reasons. A common one however, is an excess of nutrients such as phosphate and nitrogen. There is a large population of waterfowl at the lake, their numbers sustained by a huge daily ration of bread. This means there is a constant supply of nutrients into the lake, via the medium of their droppings! The nutrients in the droppings act as a fertiliser, encouraging algal growth under the right weather conditions – sudden low pressure weather characterised by thundery storms is often the catalyst. It’s not the algae itself which causes an oxygen crash, but the bacteria that feed on it when it dies and starts to decompose. As the bacteria multiply, they use more and more oxygen in the water, eventually reducing levels to below that needed by the fish to survive. Whatever the reason for the bloom, the natural recovery of oxygen levels needed a helping hand. So we used specialist aeration equipment to essentially artificially resuscitate the lake. Later that day, oxygen levels were back up to 70%. 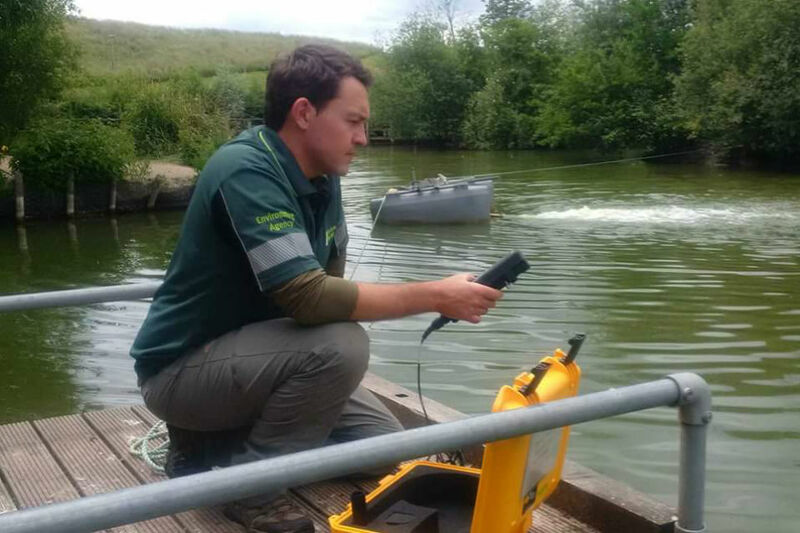 Once oxygen levels had stabilised, and with some fish seen to be spawning, we removed the aerator and let the lakes continue to recover naturally. After a few days on monitoring I’m happy to report there were no further problems. This is a very typical example of one facet of what my fisheries team and I do, day in, day out, to protect fish and sustain angling – all funded by rod licence fees. To prevent this happening again, I will be working with the town council and the local angling club to address some of the issues here such as introducing fish which are more tolerant of low oxygen levels and working with the council to encourage people not to feed bread to the ducks. If you ever find fish dying or in distress, please do report it to us straight away on our free incident hotline. That number’s 0800 80 70 60 and can be found on the back of your rod licence. With summer well and truly here, it’s inevitable there will be an increase in incidents, so please be vigilant and let us know if you see anything worrying. Stuart Manwaring has worked at the Environment Agency for 12 years, the last 3 as a fisheries officer.